A crow's-foot pattern of fractures and faults spreads south and west from Arsia Mons, the southernmost of the giant Tharsis volcanos. Some fractures slice through Terra Sirenum, while to the north others cut through an area called Memnonia. One of the Memnonia faults, in response to an injection from below of molten magma, widened and became a long linear valley, called a graben by geologists. What gives this graben — Mangala Fossae — geological interest is that the faulting released a flood of subsurface water. The waters filled the graben to overflowing, found the lowest spot in its wall, and spilled out to the north. The floodwaters carved a channel called Mangala Valles around 900 kilometers (550 miles) long as they raced toward Amazonis Planitia and the northern lowlands. 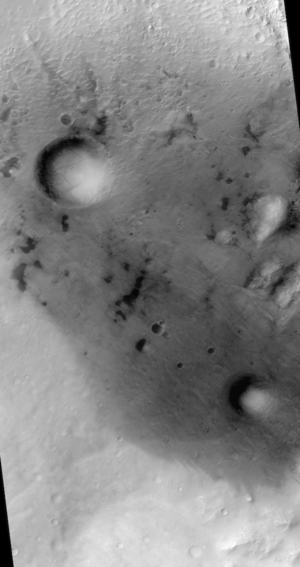 The image above showing the start of Mangala Valles is a mosaic of infrared frames taken during daytime by the Thermal Emission Imaging System (THEMIS) on NASA's Mars Odyssey orbiter. Orbiting Mars every two hours, THEMIS scans the surface below in five visible and 10 infrared bands. The smallest details it can detect at infrared wavelengths are 100 meters (330 feet) wide; at visual wavelengths, THEMIS has imaged selected regions at 18-meter (59 feet) resolution. Ample evidence lies all over Mars for lots of subsurface water and ice. Such water clearly existed in the past and may even exist today. In places, scientists suspect the water may be confined under pressure because its natural outflow is blocked by impenetrable layers of rock or simply by a capping layer of permanently frozen ground. But if anything breaks into that layer, any water present will gush out with dramatic results. Five kilometers (3 miles) wide and about 500 meters (1,600 feet) deep, this breach in the north wall of Mangala Fossae was carved by floodwaters released when the Mangala fault widened. The probable trigger for widening was molten magma pushing up into the fault, driven by volcanic activity in the vast province of Tharsis just to the north and east. One researcher attributes the features in Mangala Valles wholly or almost entirely caused to volcanic action, although most scientists see the eroding agent as water. How much water emerged, and how often, remain unanswered questions, although scientists can take an educated guess. Terraces that stairstep up and down the downstream channel walls imply several episodes of outflow. Counting craters in the channel using the High Resolution Stereo Camera on Mars Express, scientists estimate the first and largest flow occurred about 3.5 billion years, followed by three lesser episodes of flooding around 1 billion, 500 million, and 200 million years ago. Here and in numerous locations elsewhere on Mars, an outburst of subsurface water leaves a characteristic fingerprint in the landscape. Such regions, dubbed "chaos" by geologists, are dominated by hills, mesas, and valleys, which are the remnants after groundwater has escaped. One theory, not universally agreed to, proposes that giant outflows of water could release subsurface waters in places along the lengths of their channel beds. If the eroding flood scours the bed down far enough, it may plane off the top layer keeping groundwater trapped and buried. In that case, a chaos area could develop at the thin spot in the channel as water in the pressurized aquifer under the channel bubbled out. 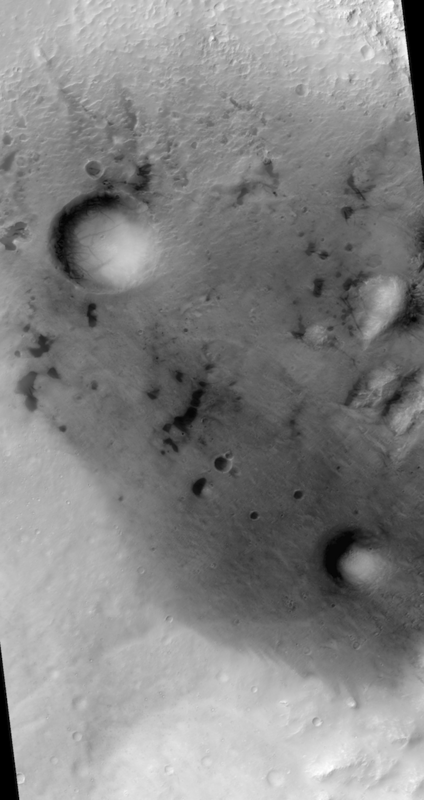 This chaos region lies in the bed of Mangala Valles, but it's unclear whether or not that happened here. When the floodwaters engulfed this terrain, their eroding power may have opened cracks that let subsurface water spill out. If that happened, the quantity was clearly less than the initial flow at the graben upstream. But floodwaters left clear signs of flow. These are especially visible in the image at right, taken by the HiRISE camera on the Mars Reconnaissance Orbiter. These two impact craters — the one on the left is 20 km (12 mi) wide — together make a narrows through which the Mangala floods poured on their northward course. The explosions that followed the impacts which created both craters blew out large amounts of shattered rock, impact-melted rock, dust, and debris. This ejecta formed aprons that surround the craters. Although this heaped up rocky material had undergone a violent shock from impact, it proved more resistant to the floods than the surface materials around and between the craters. The hydraulics of water pouring through such a narrows means that — unlike highways on Earth! — the flow runs faster though the constricted area, and thus erodes the channel floor deeper..
Mass movement of a different kind has left its traces on this crater, which lies just inside the rim of a larger one. This smaller crater is about 40 km (25 mi) wide. Both craters lie outside the bounds of the Mangala valley floods, and are probably much older. To the heat-sensing infrared eye of THEMIS, this crater holds two bright white spots. But since infrared THEMIS images record daytime ground temperatures, this means the white spots are not in fact light-colored, but instead are warmer than their surroundings. So is this a volcanic hot spot poking through? Or residual heat from the impact? Neither, really, as a look at visible wavelengths (right) shows. The "bright" spots would actually appear dark if you could see them with the human eye. What's happening here is that crater contains patches of sand and other tiny particles of rock. At the same time, over this part of Mars (and many others) a coating of dust perhaps a few inches deep has settled. When winds blow across the surface they create turbulent eddies that agitate the particles and stir them into motion. This kicks the dust up from the surface, where the winds carry it off. Left behind is the darker bare ground that grows warmer in the sunlight. And the process is largely self-sustaining, so long as the sand patches remain. The dark ground causes updrafts, which in turn can develop into dust devils. These whirlwinds help keep the sandy patches freer of dust, hence darker and warmer — and thus brighter to the thermal eye of THEMIS. The yellow arrow points to the remains of the volcanic dike that caused the action leading to the creation of Mangala Valles. When the dike widened the valley, it broke into a subsurface reservoir of water, causing floods that opened the breach seen here. The blue arrow (top) points to water-cut terraces that suggest the valley saw multiple episodes of floods. This scene, about 10 km (6 mi) wide, is part of image V04762003, taken by the THEMIS camera on Mars Odyssey. Downstream in the valley floor, the floods thinned the material covering an underground aquifer. As the subsurface waters broke out, they joined the main flood. Left behind is a tangle of mesa and hills called "chaos." The scene, about 6.5 km (4.1 mi) wide, is part of image ESP_018469_1630, taken by the HiRISE camera on the Mars Reconnaissance Orbiter. Racing between two impact craters, the Mangala flood scoured the channel deeper and carved hills and knobs into graceful streamlined shapes. This scene, 14 km (9 mi) wide, is part of THEMIS VIS image V18628003. Sand particles, kicked into motion by winds, loosened the bright surface dust. As the dust blew away, it revealed the darker surface underneath. Note the dark scrawls of dust devil tracks in the large crater at upper left. The scene, 7.5 km (4.7 mi) wide, is part of image PSP_006892_1630, taken by the HiRISE camera on the Mars Reconnaissance Orbiter.